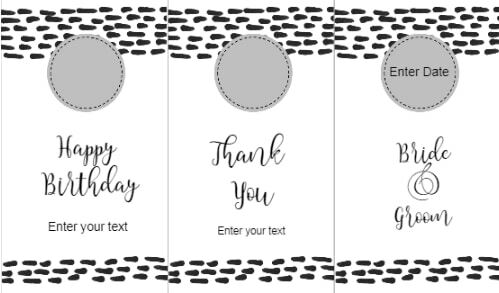 With our free online wine label maker it is so easy to make your own wine labels that they can be ready within 2 minutes only! Use our free online wine label maker to create custom wine labels for any purpose. 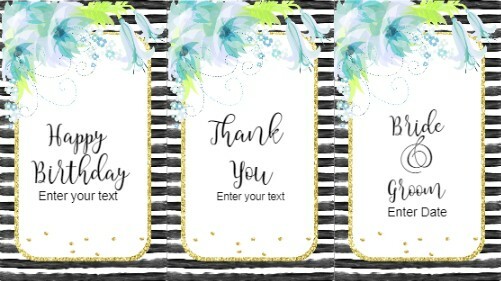 You can customize the text so they can be used for any purpose such as wedding favors or gifts. 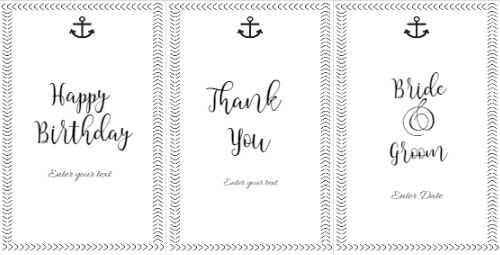 Each sheet of personalized wine labels comes with three custom wine bottle labels that can each be personalized with different text. See tips on how to remove wine labels below. You can print the wine bottle labels on regular paper and adhere with paper glue. You can also print on sticker paper. It is best to use waterproof labels if you can. If you are unsure how to get labels off wine bottles then follow these simple instructions. You will need to remove the original label before adhering the new custom label. Soak the original label in warm soapy water for a few minutes. Clean the glue residue with a soft sponge or rag. Do not adhere the custom wine label until the bottle is totally dry. Removing labels from wine bottles should be easy and they should come off after the above steps. Some manufacturers use glue that is more difficult to remove. If you could not remove the residue you might want to use glue remover to clean the bottle. You might also be able to stick the label over the old glue residue without anyone noticing that its there. You can change the wine label size by using your computer’s printer settings. To make mini wine bottle labels just make the labels smaller and vice versa. Test the size before you print in bulk. Make sure that the label fits the mini wine bottle or larger bottle depending on what you want to use. 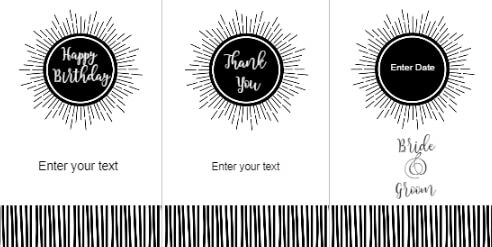 Each wine label template has a sample of a wedding label. 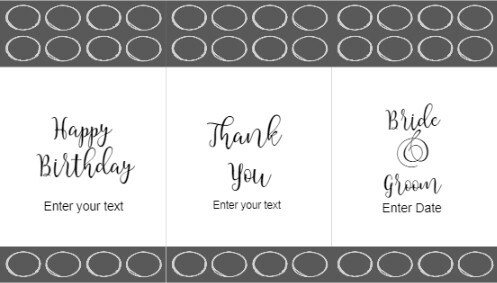 If you want to use them all to create wine labels for wedding then just change the text of the other two labels. Feel free to add additional text as well if you want. 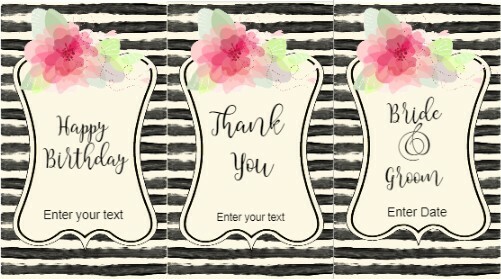 You can also edit the text to create bridesmaid wine labels. If you do not want to add any text then you can erase the dummy text by clicking on the x on the bottom right of the text box. Wine label printing isn’t as complicated as it sounds. You can actually print on regular white cheap printer paper and adhere with paper glue. You can also use Avery wine labels or another brand. If you are looking for a wine label design that does not appear here then please leave a comment and we try to help. 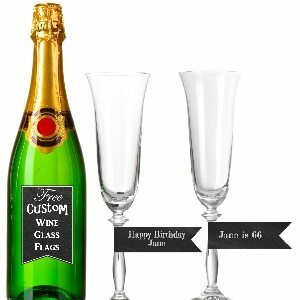 This is a great way to make glasses look special and also enable guests to keep track of their glass. 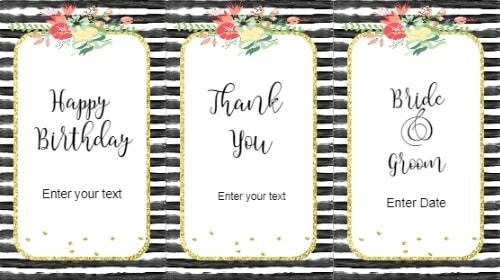 You can either write something different on each label or keep one side blank and leave some markers on the table so that guests can write their name on their glass. 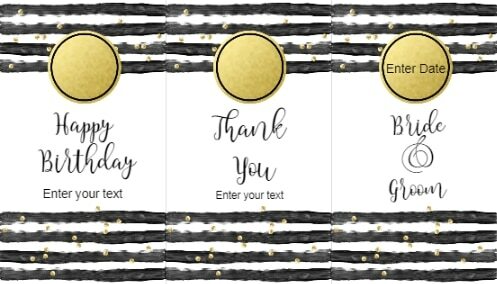 We also offer free personalized wine bottle labels to make custom gifts or favors with your own “private label wine” (see above).